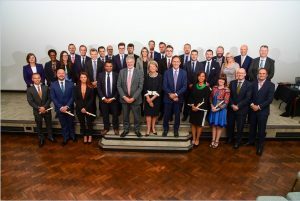 The graduation ceremony was held on Friday 15 June 2018, in the Great Hall at Chartered Accountants Hall, Moorgate, London. All members of the Joint Insolvency Examination Board offer the fullest congratulations to our recent graduates from the 2017 examinations. Steve Allinson (JIEB Chairman) gave the welcoming address and Eileen Blackburn (JIEB Board) hosted the ceremony. Tony Lomas (PwC) who is best know as the joint Liquidator of the Lehman Bank Group gave the keynote speech. A very engaging and pleasant afternoon was had by all. The JIEB Board would like to thank the ICAEW for hosting the event.